Ready for a musical tour? Get into the mood … get into feeling PMJ retro music. Scott Bradlee’s Post Modern Jukebox – British team is on a European tour and after Finland, Russia, Estonia, Latvia, Lithuania, Poland, Germany coming to Hungary on Friday, May, 27. at 8 p.m. MoM Culture Center – District, XII., 14-16 Csörsz Street – Budapest. From Hungary off to Romania and Bulgaria to give the audience their magical show. The American musician, pianist, composer and arranger Scott Bradlee already is known for his viral videos. Postmodern Jukebox are a rotating group of musicians producing alternate variations of pop songs in a blend of cool jazz, soul songs, ragtime and within their program will bring alive swing, classics tunes from the ’20s and ’50s all delivered in a „groovy swingin style”. Their music blurs the boundaries between the generations and will catch those ears who are not too comfy within the pop forms. 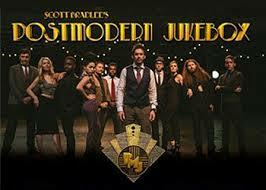 Scott Bradlee’s Post Modern Jukebox group are bringing an excellent set of tunes mixed in their own way of idiom. The PMJ are still relatively somehow unknown, this will be their first European tour and most probably will gain more-and-more fans. During their show an overall of 40 musicians will exchange the stage and a small big band will join them on stage and audience will feel the spell of being at the end of the last century. A stellar performance will be on stage and if you are lucky enough… get yourself to their show!